“Stay Thirsty” is more than an idea. It is a call to arms. 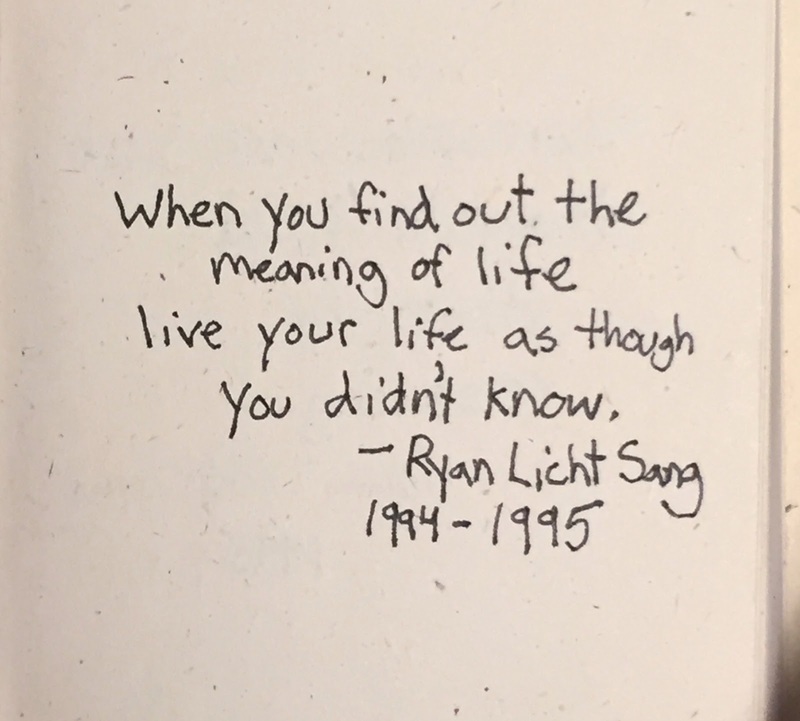 Founded on the philosophy of Ryan Licht Sang, a shining young musician, artist and writer who passed away at the age of 24 from Bipolar Disorder, “stay thirsty for life” is the magazine's clarion call to shine a spotlight on creativity and ideas in all forms from around the world. 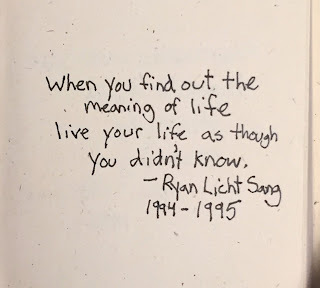 Ryan Licht Sang was born on November 22, 1979 - Thanksgiving Day. He grew up in Palm Beach, Florida, attended the Palm Beach Day School and finished high school in Southern California. He attended college in Florida and Chicago. At 14, Ryan, with his close friend Kendall Carson, age 15, formed the band funnel in 1995 and recorded a CD at Echo Beach Studios in Jupiter, Florida. The CD had eight songs with words and music by Ryan and one song with words and music by Kendall. Musical arrangements were by both boys, with Ryan doing the vocals on the songs he wrote and Kendall doing the vocals on the song he wrote. The band dissolved not long thereafter when Kendall moved away to attend high school. Tragically, Kendall passed away at the age of 23 on October 31, 2002. In 2000, after a couple years of college, Ryan changed his choice of instruments, moving away from the guitar to the synthesizer, and formed the band Since The Accident with Jeffrey Wrye. Both Ryan and Jeffrey were living in Florida where they recorded eight songs in two separate sessions at Echo Beach Studios. The first four songs were made into a CD after their first recording session. Ryan wrote the lyrics and did all of the vocals. The musical arrangements were composed by both Ryan and Jeffrey. Since The Accident played many South Florida venues, including opening in the Mars Tent at The Cure show in May, 2000. At the end of that year, both Ryan and Jeffrey moved to Chicago and played many of the local clubs. In July of 2001, Jeffrey decided to move back to Florida and left the band. Beginning in 2002, Ryan began to compose experimental and noise music on his own. For the next year and a half, he recorded a variety of compositions including some original music for the score of an independent movie. During this period, he also concentrated on producing original works of art in a variety of mediums and he worked on a novel entitled RANSOM NOTES along with several shorter works and observations. Ryan passed away in his sleep at the age of 24 in the early morning hours of August 26, 2004. His philosophy of “Stay Thirsty” for life and his larger-than-life spirit are the motivations behind Stay Thirsty Magazine. 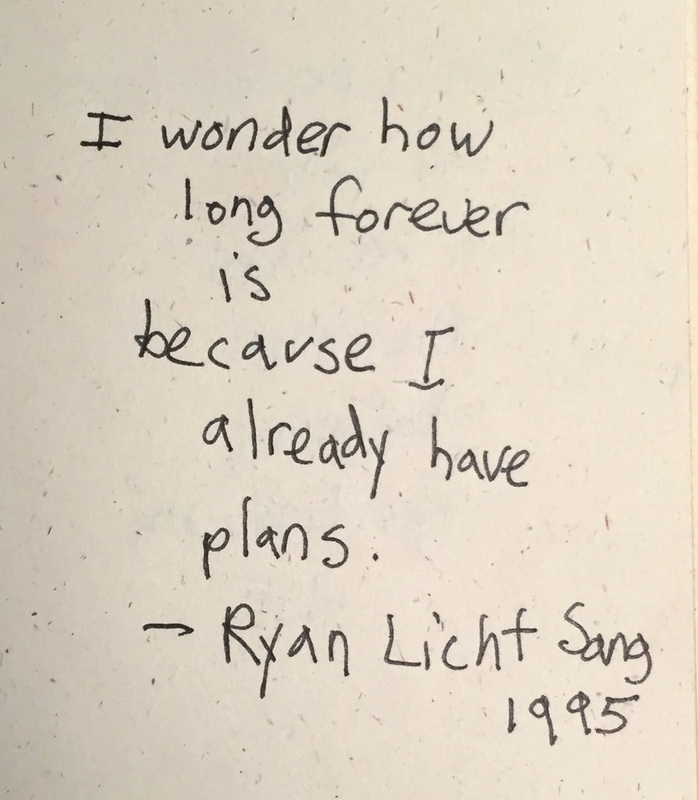 In his own words in “Death and the Depression Flower” by funnel, written when he was only thirteen, Ryan foretold the future when he sang: “…I’m gone but not forgotten”. His old soul knew what the rest of us would discover in time. 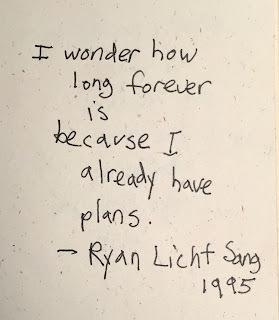 Like his art and writings, the music of Ryan Licht Sang drew from a number of iconic predecessors. Ryan viewed Joy Division’s front man Ian Curtis as a kindred spirit. The darker, more industrial work Ryan produced with Since The Accident is carried by the same echoed drumming and baritone vocals of Joy Division - most evident in “Atmosphere” and “Dead Souls”, two of Ryan’s favorites. 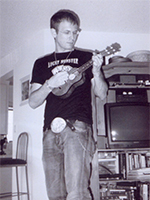 Propelled and influenced by music his entire life, Ryan was inspired by progressive and independent literary musicians. The crossover was evident. His lyrics were often narratives, written in a style used by Nick Cave and Henry Rollins, two of Ryan’s heroes. Cave’s work was particularly important to Ryan in his early twenties and his bookshelves were stacked with every biography, CD, and tape of Nick Cave, The Birthday Party, and the Bad Seeds. Industrial and noise music heavily influenced Ryan’s later works. He sought out anything outside the mainstream, and often discovered artists years before the media picked them up. Michigan’s Wolf Eyes was a favorite. He likened them to seminal acts Throbbing Gristle and Merzbow, and predicted they would bring in a new era of experimental noise. Two years later the band was on the cover of WIRE magazine. Einsturzende Neubauten’s front man Blixa Bargeld, however, should be credited with having the most influence on Ryan’s life and music. Ryan viewed Bargeld as a genius and after seeing Neubauten in concert in Chicago on their last American tour, he proclaimed it to be one of the greatest nights of his life. Everything about Blixa struck Ryan and impacted his life in ways far more than just those of a musical influence. He was impressed by Blixa's emotive lyrical content, the complexity of his compositions, and his striking physical appearance and its effect on those in the audience. Toward the end of his life, Ryan became interested in underground hip-hop. He was a fan of Beans, Aesop Rock, Lyrics Born, Sole, Atmosphere, RJD2, Diverse, Madvillian, and Sage Francis. Beans’ “Hot Venom” was a favorite track on vinyl. Ryan liked to be challenged, and abiding by his “Stay Thirsty” philosophy, he applied the intelligence and philosophy of these underground artists to his own later post-punk industrial noise works. Music was Ryan’s life. Making it, discovering it, and sharing it was his passion. 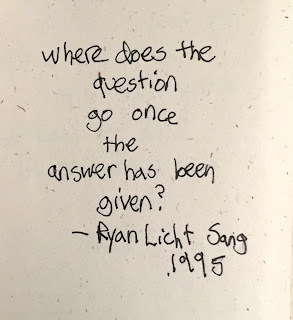 Ryan Licht Sang’s artwork came through in many forms, in many mediums, and on many canvases. Uniquely his own, but taking strongly from the influence of his favorite artists, Ryan’s work is invaluable in gaining insight into the mind of someone battling a constant noise. He could be either tormented or content, and both are represented at different stages and in different pieces of his art. Ryan could also create to entertain, as evidenced by the many humorous drawings he seemed to always be making for his friends. But his hand was usually heavy and his work rarely strayed from a theme of struggle. He used his art to expel the demons that haunted him everyday. Ryan was known for using anything as a canvas, just like Jean-Michael Basquiat, who painted on the surfaces of doors, refrigerators, stools and tables. Ryan used wood, butcher's blocks, glass, cardboard, pill bottles and even the pills themselves. His choices of medium were almost always pen and marker, or sometimes White-Out (always available to him as a front desk clerk). When it came to imaging, Ryan would use screened prints or Xeroxed images, even using part of a set of temporary tattoos on the cover of his "Manifesto" notebook. He was as experimental with his medium as he was with his choice of canvas. His present to his parents on their anniversary was a collage made from shredded and woven paper, and a T-shirt he made contains vertical symbols in black paint and duct tape, the back reading: "I want war" all the way down. Keith Haring also used phrases, stenciling things like "Clones go home!" on sidewalks in the West Village. 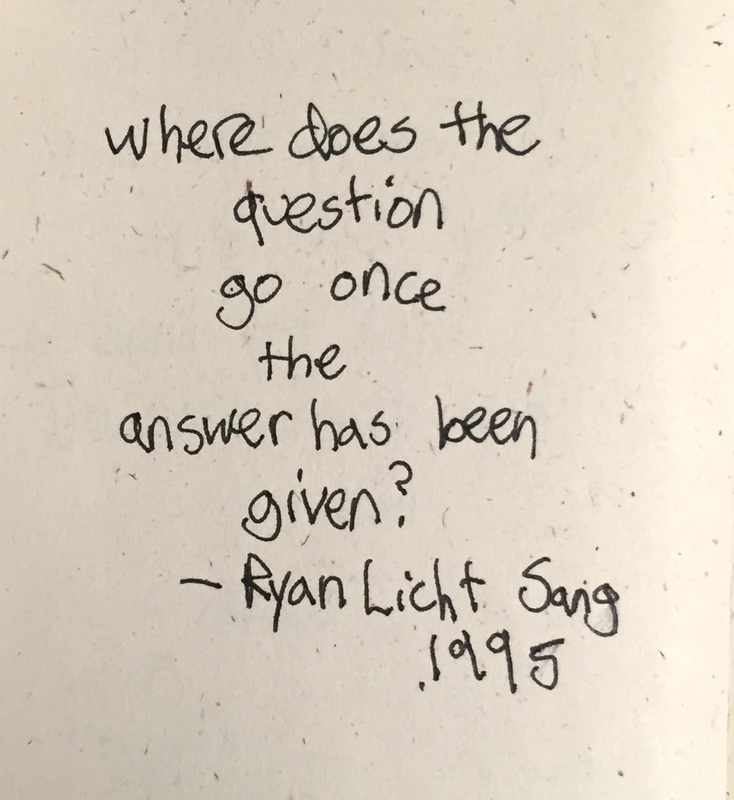 Ryan's use of phrases was his way of making similar statements- like graffiti from the front desk. His favorite phrase, “stay thirsty,” was perhaps his own tag. “Stay Thirsty” was the culmination of all of Ryan’s ambition. 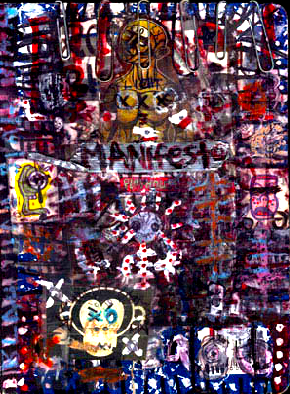 The layering and use of different mediums is most evident on Ryan’s “Manifesto” notebook cover. His work really looked the most finished by being completely chaotic and frenzied. He made a wholeness out of several smaller parts. He took original ideas, everyday things, accepted ideals and images and manipulated them as incorporations into “Ryan’s World.” He took a regular composition book and covered it, layer after layer, with etchings, words, and images. The cover acts almost like a door into the darker side of Ryan’s world. His use of color strikes one as characteristically dark, with browns, reds and blacks bleeding into the background and running together. He was a huge fan of the dripping paintings of the Clayton Brothers, who create a similar alternate world with stark colors and somber figures. Ryan's faces were always strong. He chiseled each feature, down to the lines around the mouth and deep rivets of expression by the nose. Sometimes the faces were created by lines run in circles over and over, a technique used by Doze Green, a favorite graffiti artist of Ryan’s. Ryan's art was pseudo-religious and he had a fascination with Catholicism and the Virgin Mary. In the center of his "Lucifer, Eve, Murderer" piece was Eve, a fashion advertisement painted over with the X on the head and the inner skeleton drawn in the neck and chest. 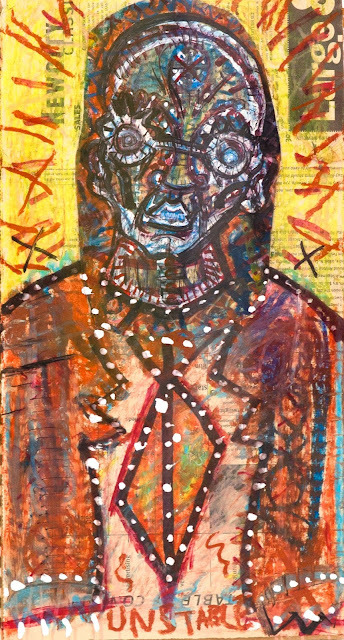 Like Joe Coleman and Basquiat before him, Ryan's own physicality and mortality seemed to be central in most of his work. He was always expressing the sinister side of his illness, with figures fighting multiple forces. The devils in his work were characterized by the X on the forehead and in some pieces have more than one head, symbolizing an internal struggle with which Ryan himself was more than familiar.